This game is amazing and deserves more than just one review. It came out in 1991 and has a new and different adventures than its 16-bit friend. (Sega thank you for this) The storyline is the same, you got Sonic saving his friends and beating Dr. Robotnik at the end. First of all this is probably the fastest 8-bit game you will ever play. The Master System run's Sonic just as perfect as you can ask for. In this sonic adventure you will have to surpass several levels. Each level has there beautiful designs and tricks to surpass it. Also there are bonus stages and secrets of extra lives hidden in levels. 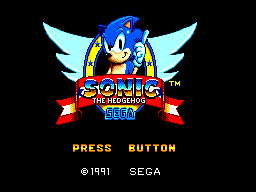 The game has a lot more challenge then the Genesis Sonic, and with the different levels, you will find the Master System Sonic great being different. Man!!! Amazing. Seeing the graphics on Sonic for the Master System, makes you think how some other platformers could have looked on are beloved system. Though alittle downsided compared to its Genesis counterpart, for the Master System its very large, as far as Character sprites, detail,animation and backgrounds. This game looks so good, that it made alot my friends who had Nintendo's, forget about SMB3, all they wanted to do was play Sonic on my Master System. Man, if only this game had been promoted better in the US. But yes graphically everthing in this game has great detail and color. Also there is no slowdown to my knowledge. 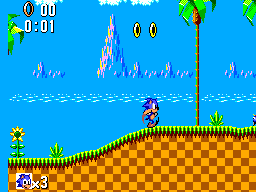 Sonic on the Master System runs very smooth and fast. The music & sound in this game are also top notch. Every level has there memorable tracks and also Sonic has his sounds as far as jumping, tha roll blade attack, and others. To be honest when I first played Sonic and the way it sounded, man it really made me glad that I was still a Master System boy. Some Music from the Genesis Sonic are hear in the Master System, and will not disapoint. Also you have tracks that are exclusive for this 8-bit Sonic. Once again the programmers did a great job. What else can I say. The controls are pretty much perfect. Even though your using one button, it doesn't take away from the fun factor in this game. Using the SMS control pad, you have full control of this game. You can use both buttons to jump, you have the spin attack, and also you can look up and down. Controls can't get no better, programmers did a great job of letting us handle Sonic, just like Genesis owners handled theirs. Well, for me this game, I go back to atleast 2/3 times a month. It can be challenging the first time around and it never loses its fun to me. I love to go back to it to show people that SMB3 for the Nes, was not actualy the best 8-bit game. All in all. Its just a very fun game and even more fun than Genesis Sonic (in my opinion). The best SMS game in my book. If you don't have it and you are a SMS fan, this is a must. 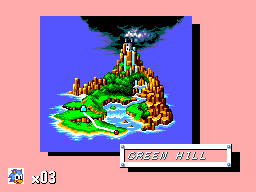 It really shows what the Master System can do and not just graphically. It has great music and sound also. This is one of those games that, you can show US and Japan gamers that the Sega Master System was really great.